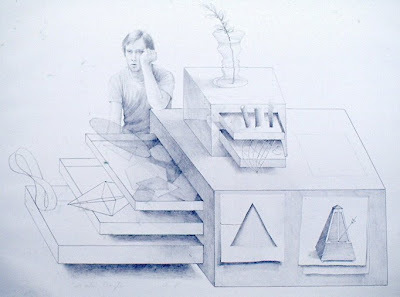 Melancholia, Self Portrait, 15" x 21"
I drew and printed this lithograph in 1978 at the Yale School of Art. Back then the print studio was adjacent to the architecture studio on the same floor. There were many influences floating around in Paul Rudolph's building: Josef Alber's tubular wall sculpture hung above the entrance. Cement casts of classical Greek sculpture hung in the stair wells. Al Held, Elizabeth Murray, William Bailey, John Walker and Gabor Peterdi were teaching. I drew this image inspired by Durer on a thin old stone which cracked in half after the second impression was pulled.